I came here after escaping Rocking Js hostel which I did not like at all, so it was such a relief finding this hostel. I really love Playa 506. The staff is really friendly. The hostel is clean, showers are warm, bed linen is clean and looks also really clean as it is white, and the beach if just perfect. 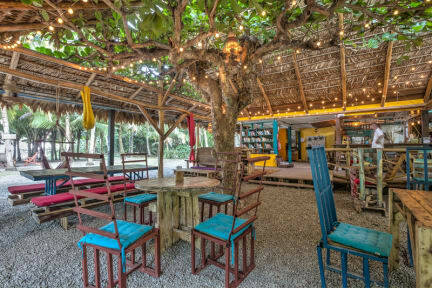 The hostel is Not crowded at all, and you can just chill and read your book or go for a nice long beach walk. Breakfast is included, eggs toast and some watermelon. Ended up staying 6 nights! Het hostel ligt op ongeveer 30 minuten lopen van het centrum, maar dat was juist erg fijn! Super mooi rustig strand waar je heerlijk kan wandelen. De kamer was helaas echt heel warm en was lastig koeler te krijgen. Het ontbijt was echt heerlijk! Zeker een aanrader als je het drukken centrum even wil ontvluchten! Heel fijn en mooi hostel aan het strand. Zou er 3 nachten blijven maar ben er uiteindelijk een week gebleven! Heerlijk! Top! Great hostel, with his own little "private@ beach. The beds were good, the kitchen provided free eggs, the shower had hot water, don't need that much more. Okey, it's a little out of town, but therefore you can rent a bike or get a taxi. O and, Francesco from the reception is aaaaawesom. Very friendly, funny, helpful, great guy! Nice hostel, dorms are clean and there is not many noise in the evening, which makes for a good night sleep. Right at the beach, very relaxing to lie in a hammock looking out over the Carribbean Sea. They have the best (fresh!) Piña Colada cocktails, this would already be a reason to stay at this hostel. Everyone going to this hostel must check if there is 24/7 running water / fresh water beforehand. During the dry-season the hostel needs to pay extra to the government to have fresh water 24/7. Which they don’t. Which is a shame if you look at the price of the stay. And also disgusting, since everyone uses the toilets still when there is no running water. The twin bedroom I booked was very claustrophobic, smelly and had hardly any daylight. And the reception was not helpful and uninterested.